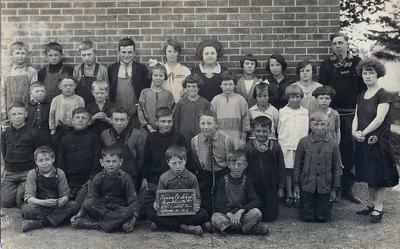 This is a June, 1926 Kinsale School class picture. The school was located on the south-west corner of the present-day intersection of Hwy 7 and Durham 23 (Lakeridge Road) and is currently part of a daycare centre. My father, Fred Buldyke, is in the 2nd boy from the right in the second row. His brother, Paul Buldyke, is in the front row (2nd from the left). Their older brother, Nick Buldyke, is 2nd from the left in the back row and their eldest brother, Steve Buldyke, is 4th from the left in the 2nd row. I am not sure of the identity of any of the others in the picture, but would be very happy to find out. Kinsale Public School was a Union School attended by students from Whitby and Pickering Townships. Kinsale School, (U.S.S. #2), June 1926, Photograph Unknown. Whitby Archives D2015_001_001. Students from Pickering and Whitby Townships attended the school. Kinsale School was built in 1860. It closed in June of 1962 when I was in grade six and my sisters were in grades four and one. (My father and his brothers all attended the school before us.) When the school closed at the end of the 1961- 1962,school year, we were bused to school in Brooklin..